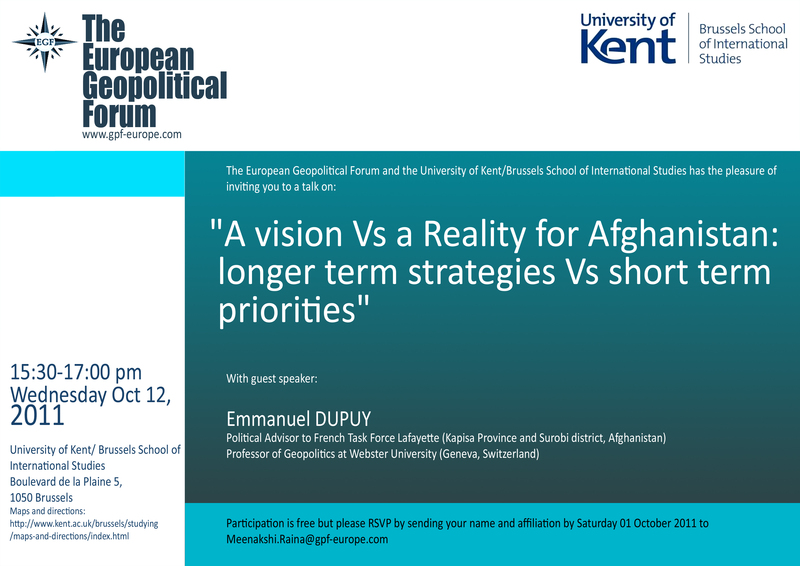 Emmanuel Dupuy presented a talk ""A vision Vs a reality for Afghanistan: longer term strategies Vs short term priorities""
On October 12 Emmanuel Dupuy (French government political adviser on Afghanistan) presented a talk entitled: "A vision Vs a reality for Afghanistan: longer term strategies Vs short term priorities" hosted by EGF in collaboration with the University of Kent in Brussels. click here for more information. Dr. Mete GUNDOGAN will present a talk on "A New Silk Road: Regional Cooperation Via a New Maritime Linkage from the Caspian Sea to the Persian Gulf"
Dr. Mete GUNDOGAN, Vice Rector, Bartin University, Turkey will present a talk on "A New Silk Road: Regional Cooperation Via a New Maritime Linkage from the Caspian Sea to the Persian Gulf" hosted by EGF at the University of Kent in Brussels on November 02, 2011. For more information, please click here. Dr. Stanislav.Z. Zhiznin presented "a new vision for Russian energy diplomacy"
Dr. Stanislav.Z. Zhiznin presented "a new vision for Russian energy diplomacy", in a talk hosted by EGF at the University of Kent in Brussels on October 4, 2011. For more information, please click here. EGF Director, Dr. Terterov argued against the prospects of democracy in the Arab World at the 242nd second session of the Historical Society of Trinity College, Dublin, Ireland on 28 September 2011. Click here for the link to the debate in the Trinity College, Dublin. Click here to listen to the audio recording of this panel. Asim Mollazade, EGF Affiliated Expert on the Caucasus and Caspian regions, contributed to multiple panel discussions on ex-USSR politics at the Kyrinca Economic Forum in Poland. Click here to listen to the audio recordings of his panels. The Initiative on Countersigning of the Energy Charter "Kazakhstan - European Union - 2020?" Potentials and Perspectives? On September 26, 2011, The Centre on Contemporary Studies "Alternativa" will conduct a round-table discussion in Almaty, Kazakhstan where a pool of experts will address the theme of "The Initiative on Countersigning of the Energy Charter "Kazakhstan - European Union - 2020?" Potentials and Perspectives?". For more details of the meeting, click here. On September 9, 2011, Dr Marat Terterov, EGF Director and Founder, moderated a high level panel discussion on whether the countries of the former-Soviet Union are a geopolitical asset or liability for Russia, at the annual Krynica Economic Forum in Poland. To listen to the full audio recording of the speaker interventions in this fascinating panel discussion, click here. Turkey's General Election: What Does the Outcome Mean for Britain, Europe and the Middle East? On June 14, EGF global energy expert, Mehmet Ogutcu, participated in a high level roundtable on 'Turkey's General Election: What Does the Outcome Mean for Britain, Europe and the Middle East? ', with former British Foreign Secretary, Jack Straw, Baroness Nicholson of Winterbourne, as well as British and Turkish Ambassadors at the National Liberal Club in London. The event was organised by the Global Strategy Forum. Click here to read the roundtable paper on the "creation of a Marshall Plan for the Middle East"